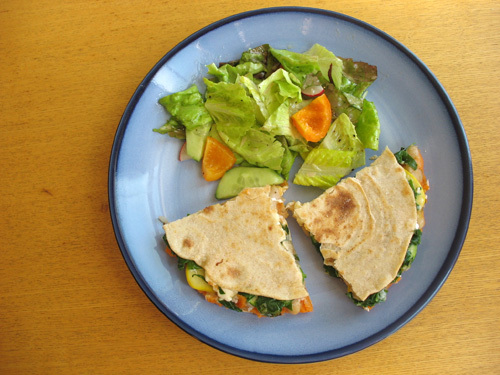 Sweet Potato, White Bean, Zucchini and Chard Quesadillas with Homemade Tortillas | Gotta Eat! Given my recent infatuation with white beans and homemade flour tortillas, it seemed natural to combine the two. 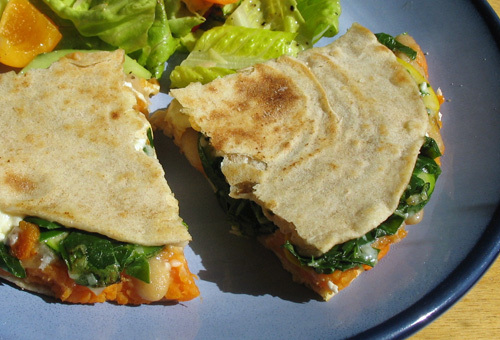 I decided it’d be fun to make quesadillas using mashed sweet potato as a complement to the white beans, along with chard for health and zucchini for a little crunch. Yum. Makes enough ingredients for 2-3 quesadillas. 2. Heat medium sized fry pan or cast iron pan with a teaspoon of oil. Saute onion until softening, about 5 minutes. Saute chard until cooked, 6-10 minutes. Add zucchini and saute about 2 minutes. Add garlic and saute until fragrant, about 30 seconds to a minute. Set vegetables aside in separate bowl. Wipe out pan and coat with small bit of oil. 3. Place a flour tortilla on a plate. Spread sweet potato in a thin layer covering the entire tortilla. Next add white beans, lightly mashing into the sweet potato. Add the vegetable mix, a dash of salt, generous fresh cracked pepper and thyme and finish with cheese of your choice. Place second tortilla over the top. 4. Heat pan on high heat until hot, 1 minute or so. Place tortilla in pan and cover, reducing heat to medium high. Cook 1 minute, then carefully flip using a large spatula and cook 1 more minute, again covered. 5. Place quesadilla on plate and cut into 4 equal pieces, and serve hot. This entry was posted in Autumn, Breakfast, Brunch, Dinner, Lunch, Recipe, Snack, Spring, Summer, Winter. Bookmark the permalink.